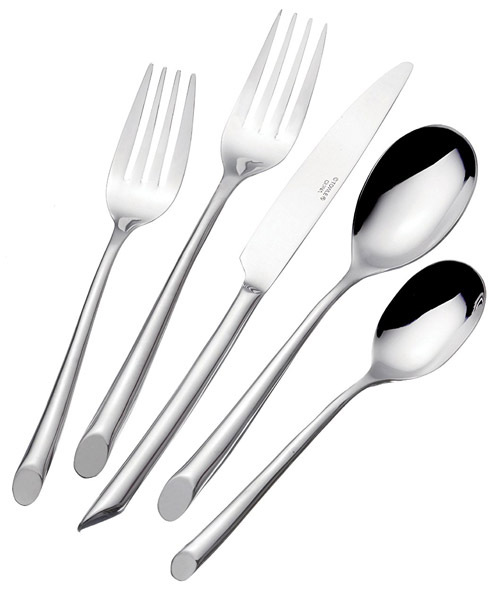 Towle have been Silversmiths since 1690 and we are just starting to look at their product line starting with the Living Wave stainless steel cutlery set. It is a 42 piece flatware set with service for eight. This consists of a dinner fork, salad fork, dinner knife, dinner spoon and teaspoon. But wait there’s more! It also includes a large serving spoon and a large cold meat fork. The bias cut at the end of the handle is a great dangerous looking touch. It is made of a heavy gauge 18/0 stainless steel that is dishwasher safe. But there are some reports of rusting, the key is not to let them touch in the dishwasher. This applies to all stainless steel cutlery.